Each person involved in Unified Champion Schools, and Special Olympics does it for their own reasons. They each have wonderful experiences that build up to this day, and this moment. What brings us together? The belief that everyone deserves respect! 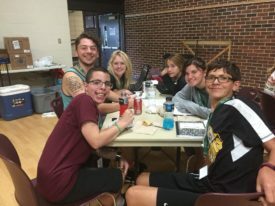 Here are some stories from the members of the Unified Champion Schools Youth Activation Committee! My experiences and how I got to the position I am today is one of my favorites. It started in my freshman year of high school. At my school you are required to take 6 quarters of PE to graduate. I was chosen to be a part of the adaptive PE and from there the story begins. Today I have taken all four years of adaptive PE because it’s my beginning and favorite part of the day. My junior year I started to go to the teachers room to work with the students with disabilities instead of going to my study hall. Also my junior year was the first year that I was a key club officer and actually the first male key club officer. Then my teacher asked me to go with him to the YAC summit. From there everything boomed. I have realized that this is not only a passion of mine but also what I want to do for the rest of my life. I have never been so blessed in my life thanks to the amazing friends I have made. They are my other family and I am so happy I have this opportunity. It has been fun to be a part of Unified Champion Schools. I enjoy playing Soccer, Flag Football, Bowling, and Basketball. I like helping my teammates and making friends. I am a 15 year old Freshman. This year is my second year in YAC but my fifth year being involved with Special Olympics in general. Back when I was in fifth grade, I always had interest in working with kids, with and without disabilities. I fortunately got that opportunity and it started a love for working with kids that everybody labeled different, but I knew we were the same as me. As time went on, I started wondering what else I could do with my newly found passion. My teacher thankfully introduced me to the many Unified Sports that were available. 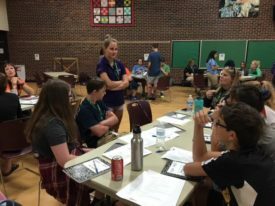 My 7th and 8th grade year I played both Bocce and Soccer, and fell in love with it, which led me to apply for the YAC Committee where I am right now, and where I am planning on staying as long as I can. I would like to expand what sports I can play through Special Olympics so I can get a chance for my love to grow for Special Olympics. Also, with being accepted into the Committee, I have met a lot more people that share my passion and that try to involve Special Olympics into their everyday lives. Special Olympics has given me the opportunities that no other thing has given me. As long as I am able to participate in these activities, I will not throw away my passion for anything in the world. 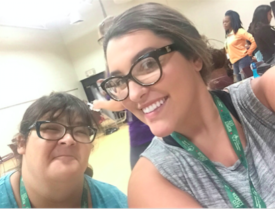 In sixth grade my teacher came to my team and asked if anyone would be interested in helping students with special needs in PE (our tutorial). I signed up, not knowing that it would change my perspective on respect, on people, and on the world. I did it every Tuesday and Thursday and those days, turned into my favorite days. I met my partner and we had fun together, so I’m hoping he did. I don’t know if many people realize it, but adapted PE doesn’t just impact the athletes, it leaves a mark on the partners too, if not a bigger one. We left the gym every day knowing that we changed the world. Maybe not in the world’s eyes, but in our partners. We helped them do what they love. Just knowing that they were happy, was all of the thanks we needed. Nobody will understand how amazing it is, until they’ve done it themselves. I am doing this because I want to continue to spread respect and love to the kids with special needs. I love getting to work with them and I can’t thank God enough for giving me the opportunity to do so. They are the sweetest things in the world, people just have to be willing to give them a chance. My memories with my friends, and the memories that are to come, are memories that I will never forget, because the day I stepped into that gym, my view on the world, completely changed. Check out our blog in the upcoming weeks to see more of our stories! Preparing for the Unified Champion Schools Youth Activation Summit! We recently had an amazing Bootcamp weekend with all of the students who will be teaching sessions at the Youth Activation Summit in November. The powerful model of Unified Champion schools is students teaching students. We know that students pay more attention to what other students have to say, and the expectation for participating in our summit is that the students will take away information to implement inclusive and unified activities, as well as, a Respect Campaign in their home schools and districts. What better way to get ideas and be inspired, than from people that are just like you? Students relate to each other, and can have authentic conversations about their struggles and successes. Check out some of our wonderful participants! So excited to plan and get ready for the summit! Hi! My name is Grace My new friends are Erin, Abby, Tom, Sue, Eddie and my advisor, Ms. Pehlke. At the Summer Games aquatics venue, Reem Abdelmeguid, 17, of Bourbannais got the rock star treatment when people realized that she was the athlete who designed the 45th anniversary T-shirts being sold at souvenirs. Earlier this year, Special Olympics Illinois held a 45th anniversary T-shirt art contest asking athletes to submit designs. The top 3 entrants had their artwork displayed on the SOILL website and the public voted for their favorite design. Reem’s design was the winner with more than 55 percent of the nearly 6,000 votes. “Reem always loved art projects. She liked to color and design stuff, and she loves to draw these social stories about her day and all the events she went to,” said her mother. “We’re at Barnes & Noble all the time looking for new art projects,” said her mother with a laugh. Reem participates with Bradley-Bourbonnais Community High School, where she will be a senior in the fall. 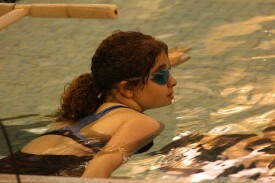 She competes in basketball, aquatics and athletics. She swam in the 50-meter freestyle and 50-meter backstroke races at Summer Games, earning a silver medal and 8th place ribbon respectively. After each of her races, the aquatics announcer let the audience know that Reem was the artist of the 45th anniversary T-shirts. 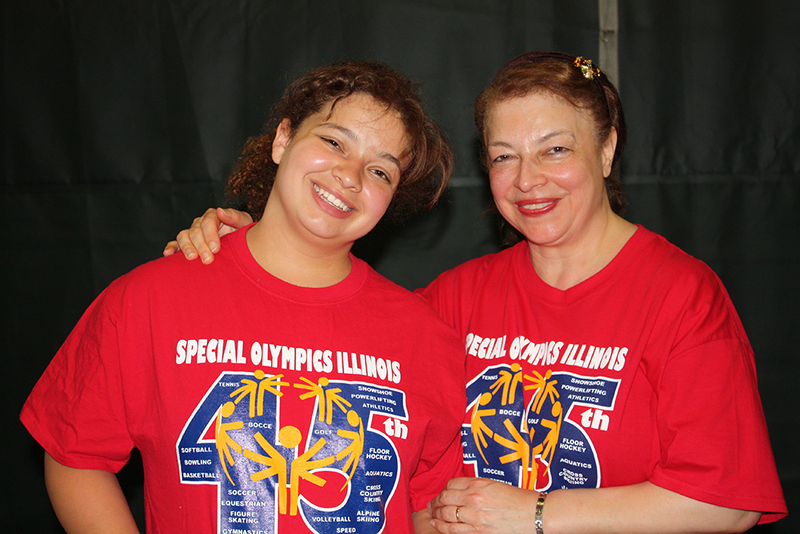 “Special Olympics was a great discovery that allowed Reem to participate in competitive sports and have fun at the same time.” Her daughter is very shy, but has become more social and loves to do activities with her peers, Tawfik said. Reem participates in The Easy Street Theater in Kankakee. “She used to whisper when talking. Now she has a great voice and she communicates with people much better. She has more eye contact and she pays more attention to what’s going on in her environment,” her mother said. “I really really think that Special Olympics was the best thing that happened to Reem and our family in a long time,” Tawfik said. Reem is an honor student at BBCHS with a GPA of 3.7. She loves algebra, English and current events and has beautiful handwriting, according to Tawfik. In her free time, in addition to creating art, Reem likes to read, play Wii Fit and make friendship bracelets. In 2012, she won the Most Improved Player award on her Special Olympics Basketball team, in part because she is such a skilled shooter. It was a “golden moment” all the way around, from the rays of sunshine bathing the Illinois State University track and field facility to the glistening winner’s medallion that hung from the neck of 16-year-old Rachel McGrew of Downs. 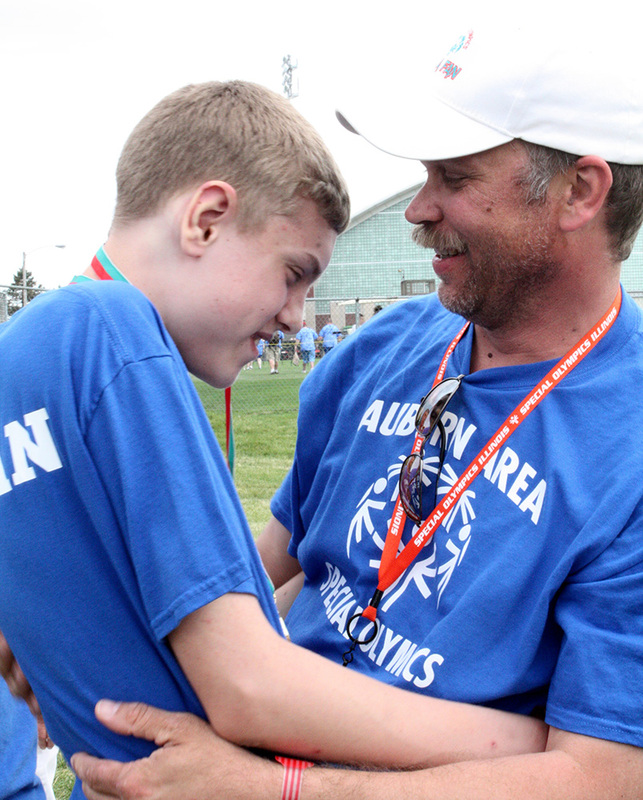 Shining brightest, however, was the light of love and an innate passion for the games reflected in the beaming faces of nearly 4,000 athletes at the Special Olympics Illinois Summer Games. McGrew’s love for her late father, Buddy, spurred her to “go the extra mile,” doubling her usual race distance in remembrance of him. While normally competing in the 200-meter run, Rachel claimed her medal in the 400 after knocking a full minute off an earlier time. 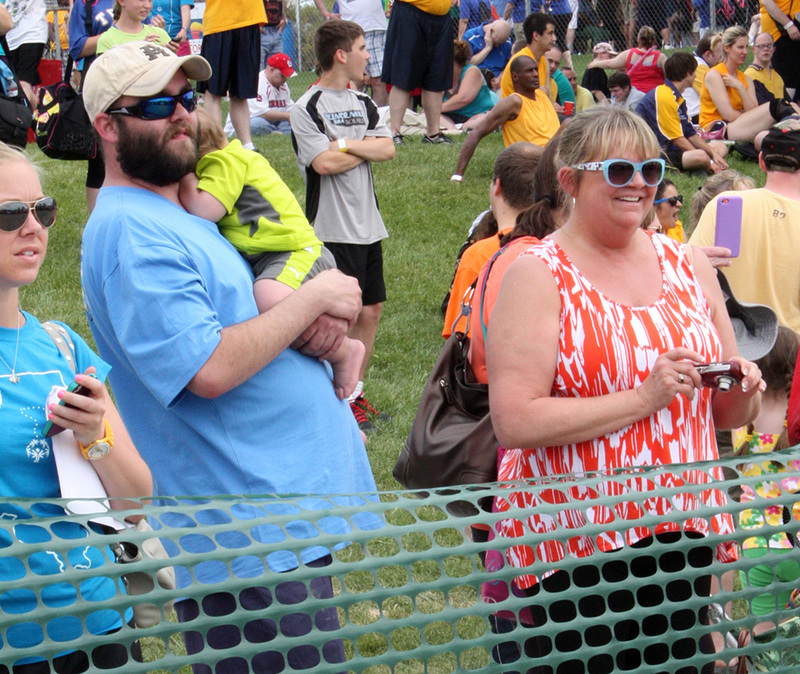 Just prior to the start of the race, as a means of motivation, Rachel’s mother, Sandra, got Rachel’s attention and pointed toward the sky. “Before her dad died, he told her she could always find him in the sunshine,” Sandra McGrew said. “That’s when he would be there for her. Buddy suffered from cancer and we had him at home the whole time. It was a joint effort of all of us helping to take care of him. “She got the rest of us through it. She has such faith, it humbles you and teaches you that life is so precious. We’re so lucky to have her,” said Sandra McGrew. The family so believes in the power of Special Olympics that they asked that any donations made in Buddy’s memory be made to Tri-Valley Special Olympics. “Bud’s putting on a party this year at Summer Games,” said Sandra with tears in her eyes. Rachel McGrew’s brother, Wesley, and mother, Sandra, cheer her on at Summer Games. Buddy McGrew’s death on March 3 marked the second time in the past year that Rachel, a student at Tri-Valley High School, has had to deal with the loss of someone close to her. Brittany Woods, her best friend, died in June 2012. Rachel has battled through the sadness and grief while continuing to be a strong contributor to her Tri-Valley Special Olympics team. 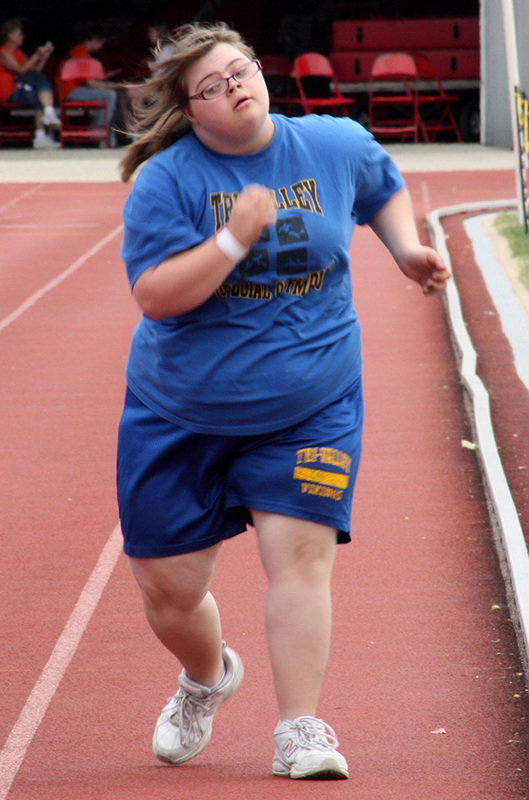 Glenda Walsh, Rachel’s track coach in the Tri-Valley program, said she wasn’t surprised to see Rachel claim a medal at Summer Games. Sandra McGrew says the road to the Summer Games medal included some arm-twisting from Walsh that got her family involved in the program when Rachel was at Tri-Valley Elementary School. Walsh was beaming alongside Sandra McGrew, both taking pictures, when Rachel accepted her medal during an awards ceremony. Michele Evans Henson, SOILL Director of Communications, also contributed to this story. Jordan VanKooten, 15, a Special Olympics athlete from Pawnee (Area 17), has rockets on his feet. Before his races, he “prepares” his shoes by “lighting the rockets” on them. 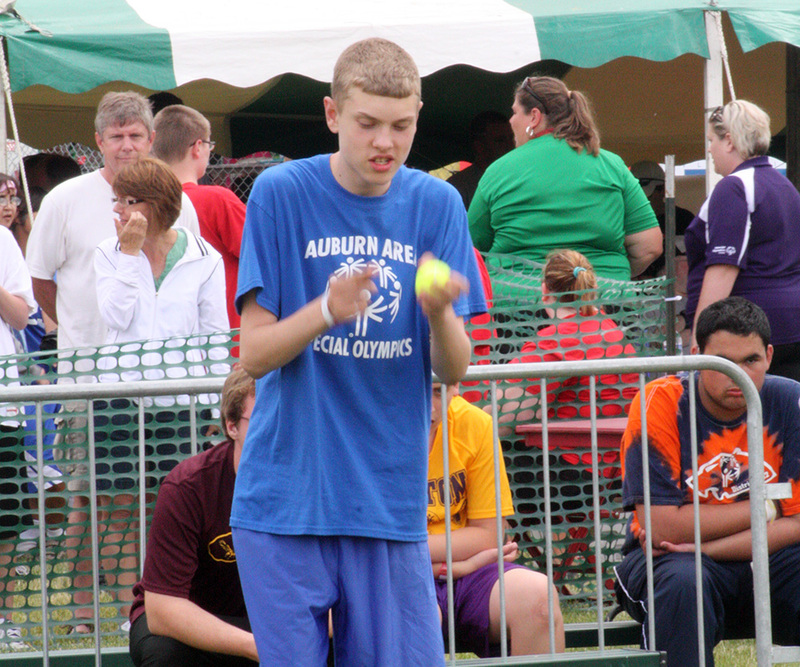 Jordan participated in the 100-meter walk and tennis ball throw at this year’s Summer Games. Before each throw, he would “light the rocket” on the ball. 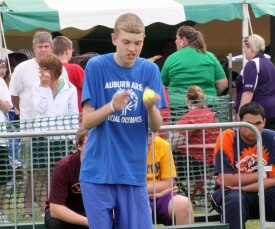 Jordan VanKooten “lights the rocket” on the tennis ball before throwing it at Summer Games. Jordan became involved with Special Olympics Illinois just two years ago. His father, Kelly VanKooten, sought out information to get his son involved. He was directed to Auburn schools and coach Terry Szerletich. VanKooten had the medical application done in record time, and Jordan got scores in for the 100-meter walk and tennis ball throw. Since then, he has participated in basketball skills, volleyball skills, and golf, in addition to his track and field events. VanKooten is an assistant coach for the Auburn team and helps with the training of athletes. There are four athletes from Pawnee on the team. Jordan will be starting high school in the fall at Auburn with his fellow teammates. Jordan’s older brother, Dylan, assists at volleyball and basketball practice when he’s done with his football practices. 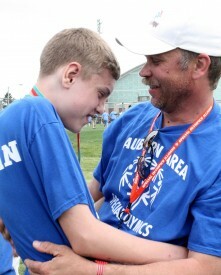 Kelly VanKooten hugs his son, Jordan, after receiving his gold medal for tennis ball throw. In just two short years, VanKooten has seen quite a transformation in his son. Jordan won gold medals for both his tennis ball throw and 100-meter walk at this year’s Summer Games. He has won 19 medals and two ribbons in his two years with Special Olympics. “He loves Special Olympics,” said VanKooten.